I forgot to write here about a major resources lastly released on internet for FLOSS digital painters : GPS 1.5. Maybe I was too much 'in my DVD production' to write about : but here is an attempt to repare this. Update: This resources is outdated and unmaintained : it won't work with recent version of Gimp ( 2.8 and more ). I do not maintain Gimp brush anymore, I'm using Krita. GPS 1.5 ( for Gimp Paint Studio ) is a collection of pre-made settings and users preferences to run with Gimp 2.6x series ( not yet adapted for the 2.7 + series ). The pack include a default user interface panels positions , brushs, gradient, textures, palettes, and the most important ; a lot of incredible presets for all tools. The presets are incredibly good, and the main author Ramon Miranda really demonstrate with success his knowledge of doing good and strong presets for digital painters. ( Congratz again ! And thanks for the help and effort into merging Chaos&Evolution brush kit ) . So now , digital painters with Gimp-painter don't have to choose anymore between GPS and C&E :) Btw, I use GPS till the beta version, released months ago , ( and so , in my DVD Blend&Paint ) . Instalation for Linux users : you can paste simply this line by line in a terminal , the command start with a copy of your existing preset and gimp configuration , because it still important to keep the possibility to revert later. mentioned at the end of the article, 5 may 2011 . Hi man, nice to see you are more available for other projects like GPS. first, thanks for the post, which is good for people who wants to start painting with free libre open license software. I was watching the links and the www.makeuseof.com is a great resources place. thanks for the link. Many thanks again for all your work around GPS , you are really the 'brush setting master' ; and no doubt about it. I really hope to see an equivalent of GPS for Krita in a future, as well as future GPS for Gimp 2.8+ . Hello David, tanks for the update on gps. As I know you are à unlimited source of knowledge about opensource softs i wondered id you knew something about an eventual script or plugin to change brushes size on the fly in Gimp with à drag and clic shortcut like in corel painter or photoshop. First off, thanks for your effort. Both of you do a lot of work on GIMP over the years and I personally do appreciate it. Secondly, How do you manage your brushes in GIMP. 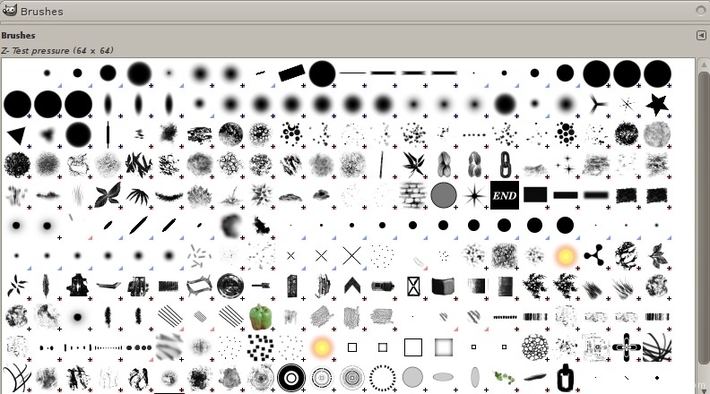 Other than having GIMP load in a single window, the biggest issue I have is organizing my brushes. @Steven: thx :) for organizing, I try to clean and name them to make my brush sorting in a logic way ; for the preset, I edit the text files and do copy paste for sorting the data text block in the right order . Btw , organisation and management of ressources in Gimp 2.6 is a known isssue ; I'm happy next Gimp already include the precious feature 'tagging ressources'. Attribute 2 shortcuts for the 'Decrease Brush Scale' and 'Increase Brush Scale' ; here I use 2 punctuations key on my french azerty keyboard ' : and ; '. They are 2 key side by side easy to find next my space bar. I have played with 2.7 and it definitely going the right direction but going between 2.6, 2.7 and PS CS5 is somewhat daunting. I guess I am just waiting for 2.8 to be released ...me and so many. It is good to see the effort that is going into it. Really apreciated coming from a talented artist like you.We can start to work in the update when 2.8 will be out, for the moment i am painting and painting which is what i love to do. but we could start to email us with new ideas about GPS. what do you think? i know there is lot of things that could be improved or enlarged. Well thank you for the answer, I think I will change my < and > shortcut for , ; as you said they are easier to access from left hand which is on space-bar most of the time, and since Mypaint uses , ; too it must be less confusing while switching between Gimp and Mypaint. GPS looks very interesting. Unfortunately, I have troubles using it with my wacom Intuos 4 L. The drawing works one time out of two, and it's very difficult to draw like this. Désolé pour mon anglais si c'est bourré de fautes. Le tracé ne fonctionne qu'une fois sur deux, et l'autre fois le curseur reste bloqué. Pour dessiner, il faut toujours compter un coup pour rien sur deux et c'est très pénible. J'ai désinstallé GPS et c'est rentré dans l'ordre. @Touffe : Merci ! Je n'ai jamais été au courant de ce ralentissement, mais ça doit être pénible. J'ai eu des crash avec GPS et certaines brosses moi dernièrement. Je me demande si le trop plein de preset ne plombe pas un peu Gimp. A voir ; si jamais je trouve un relation de cause à effet ; j'en parlerai sur ce blog. Thanks a lot, you both are amazing, thanks David Revoy and Ramon Miranda for such tools, you guys make Gimp go beyond evolution XD . Cheers! Thank you so much ramon and deevad for the great work in the community. @yoann : Thx ! For the moment no preview icons are decided on the Gimp side for presets ( but I have not a lot of infos in this direction ). Hello, everyone. I need help (sorry for my english). I can't set a keyboard shortcut for the opacity and more dark/light (that said in C&E video tutorial). I even add some lines in ".gimp-2.6/menurc"
A very complete article about how to configure Gimp for painting. Sorry to didn't include this step on the DVD btw. Hope you will like it. Hello, David. That link is wery helpful. Thanks a lot for help again. It may be a stupid question, but where specifically is the "mixbrush tools"? I looked under brushes and tools among others and didn't locate them. @Steven Powers (SMP) : If you don't see it I doubt you have Gimp-painter installed , or maybe a fresher Gimp 'classic' from a ppa or deposit overwriten your Gimp-painter installation ( it happen, here in Synaptic I had to 'force version' of Gimp-painter to refuse the Gimp normal updates ) . To see if it's Gimp-painter or Gimp, the classic thing is to go to Help > About ; if it's Gimp-painter, it should be written at this place. Thanks. That is exactly what I was doing. I had GIMP and not Gimp Painter installed. But I have rectified it and updated or graded it with GPS files. I will have to give it more attention and see what I can and cannot do with Gimp-Painter. I like the feel of it being very similar to PS, but I will have to spend time on it ...something that is always in short supply of. 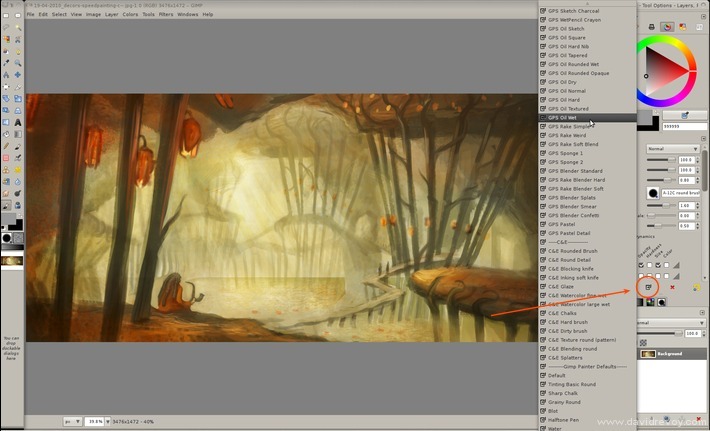 I saw your comments on Deviantarts in regards to patching GIMP with gimp-painter. This is what worked for me on Ubuntu 11.04 Thank you for your command lines. 2- Open up a Terminal Window and copy and paste the following. 3-The got to the Ubuntu Software Center (Application Ubuntu Software Center) and install Gimp. 4-Verify that Gimp as been patched with Gimp-Painter by running GIMP and going to "Help>About" and seeing that under the GIMP title states gimp-painter." @Steven Powers (SMP) : Oh cool if one of my post out-there helped you to install it correctly. Thanks to paste it here too as you did Steven. Thanks again to the Mizuno ppa ; a real help in this world. @kot-barbos : Your path is good ( here I used ~/.gimp-2.6 witch is same as /home/username/.gimp-2.6 ). If your Gimp is a 'normal' gimp ( especially if it's a 2.6 series ) you will miss the mixbrush tool, the G-pen, and flow option on all the other tools. 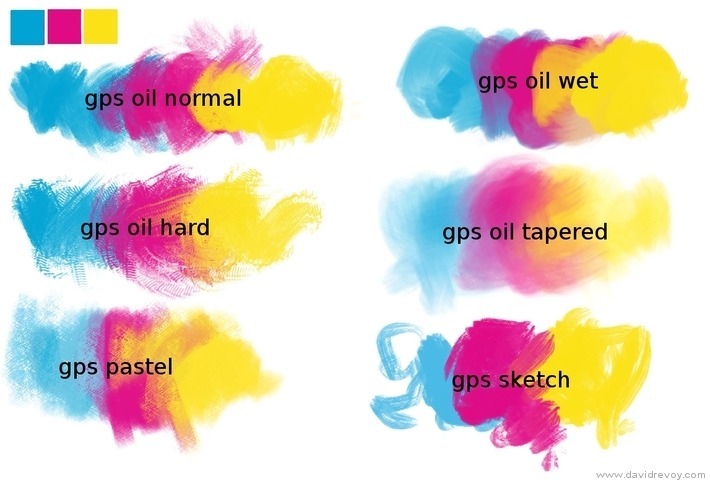 GPS provide also presets for the 2 new tools of Gimp-painter : Mixbrush and Gpen. Oh my...Now I understand the difference between all of them. do you have those brushes for photoshop too? Or is there a way to open them or convert them? Thanks for this article, now I know that there's Gimp Paint. I am learning to make digital painting but I use Gimp 2.7 program, here's my blog for my paintings www.gilbertdigitalpaints.blogspot.com, I am a beginner so your comments and suggestions will highly welcome. @Gilbert : Hey Gilbert, thx for sharing your URL . Sure you are a beginner and we all started like that. So, it's hard to give a specific advice ; may be keep painting , have fun doing it, and share your work on forum of digital painting ( Cghub , Cgtalk , etc... ) to get feedback from other who learn. Also, on the tutorial part of my website, you 'll find many videos to study with Gimp ( even if it's old version ). @Miza : Hey Miza, Ramon , main maintainer of G.P.S just emailed me his last pack yesterday about it. I think it will reach soon the GPS website. Hey David, just one question. This vertios of GPS works with Gimp 2.8? @Alejandro Recoba : hey, they will partially work ; the brush tip (the shape of brush ) and the pattern ( the textures ) will be loaded in 2.8 as resources. Unfortunately, all the presets will be broken ; the brush engine got a refactor between 2.6 and 2.8 , and the new one is -in my opinion- a mess on the user interface. That's one of the reason I didn't invested more of my time with trying to work in Gimp. When I first saw the image above, I thought this is about Photoshop, because we can do digital painting in Photoshop. I think GPS is an advanced software of PS. Can any one clarify me about Photoshop and GPS. Always a good read, love tech articles that are relevant.